The pagan writer Pliny the Younger attests to the existence of deaconesses in the church in Bithynia in the second century, and documents of the late third and fourth centuries (including the Didascalia and the Apostolic Constitutions) describe the ministry and duties of deaconesses, including assisting at the baptism of women and visiting and ministering to the sick. The ministry disappeared in the West and declined in the East for a number of centuries, but was revived in the Lutheran Church in the nineteenth century, when Pastor Theodor Fliedner opened the first deaconess motherhouse at Kaiserswerth am Rhein. At the request of a local pastor, Fliedner brought four deaconesses to American in 1849 to work in the Pittsburgh Infirmary. In following decades, other deaconess communities were founded in Lutheran population centers both in America and in Europe. In 1862 Elizabeth Catherine Ferard was licensed as a deaconess by the Bishop of London, thus becoming the first Anglican deaconess. Born in 1842, Isabella Gilmore, sister of the artist William Morris, was widowed at the age of 40. 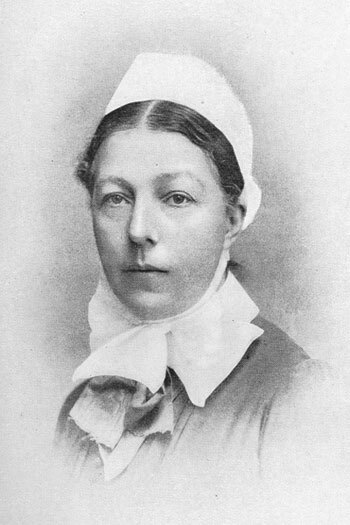 She began training as a nurse at Guy’s Hospital, London in 1882, and two years later, without children of her own, she took on the care of the eight children of her late brother Randall. She died on April 16, 1923 and is commemorated on this date in the Calendar of the Church of England. Deaconesses were eventually introduced into many Anglican Churches. The office of deaconess has disappeared in those Anglican Churches that ordain women to the diaconate, but the office has been maintained as a commissioned or consecrated lay ministry for women in a number of traditional Anglican Churches, including the Reformed Episcopal Church and the Anglican Province in America.